MailChimp can be an extremely powerful tool for communicating with and retaining your customers. The EDD MailChimp extension allows you to subscribe customers to specific email lists for later communication while following the MailChimp rules for adding people to lists. If installing on an existing EDD store, the MailChimp extension will not add existing customers to MailChimp. To do so, you will need to export customers from EDD and import to MailChimp. These email addresses should be imported as Transactional users since they have not opted in as a subscriber. To configure the MailChimp Add On you will need to complete its settings. Then click on the MailChimp link right under the tabs. (Optional) Edit the "Label" to something relevant such as "EDD on <mysite.com>"
Return to the MailChimp Settings in your WordPress dashboard and paste/enter the MailChimp API key into the MailChimp API Key field. Click the "Save Changes" button at the bottom of the page. This will allow the MailChimp Add On to retrieve the mailing lists from MailChimp. Choose whether or not to "Show Signup On Checkout." When selected, this option output a checkbox on the checkout page giving the customer the option to sign up to the mailing list selected in step 13 (below). Add a short, appropriate description of the checkbox in the "Checkout Label" field. If left blank, the buyer will see "Signup for the newsletter". Select "Double Opt-In" if you would like customers to receive a verification email before being subscribed to your mailing list. 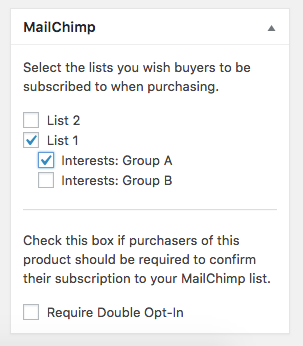 Select "Replace Interests" if you'd like your customers' interest groups to be replaced in MailChimp when they make a purchase. Interest Groups in MailChimp are one way you can choose to target emails to specific customers. For example, using interest groups, you could send emails only to customers who are interested in "Product A". The way this extension works is that if a customer purchases "Product A" from your store, their interest groups will include "Product A" alongside any other products they have purchased. But if you select the "Replace Interests" option, any other products they've purchased will be removed from their interest groups, as opposed to simply adding "Product A" alongside those other interests. If you want to include test (as well as non-test) purchase information to MailChimp, check the option called "Record eCommerce Data in Test Mode". Note that by default, purchase information is sent to MailChimp so that you can send emails to specific customers. For example, you could send emails to "First-time purchasers" only within your MailChimp dashboard. Under "Available Lists" choose which lists you'd like to connect. Only lists that have been connected can be used with Easy Digital Downloads. Click the checkbox next to each list you'd like to connect. Click "Save Changes" at the bottom of the screen. This will connect those lists from MailChimp to your store. When the page reloads, you'll see the lists you chose to connect listed under "Connected Lists". Note: if you do not see any lists here, it's possible that you haven't created a list in MailChimp yet. Create a list there first. Choose a default list. Under "Connected Lists" the first column shows which list is the default list. This list is the one that will be used at checkout when customers choose to join the list. The MailChimp extension contains a number of options, this is the recommend best practices for most stores. The EDD MailChimp extension allows you to offer a Newsletter signup upon checkout as well as add customers to a List and/or Interest Group based on what product is purchased. Although you can connect multiple lists, for best practices it's recommended that you only connect one list to the MailChimp extension. MailChimp counts the same email address added to two separate lists as two email addresses so it's in your best interest to use a single list (in most cases). The default list selected in the MailChimp settings has two purposes. It is the list that stores all transactional data from the purchase which is used for MailChimp’s e-commence features (ie Sending Receipts via MailChimp) and segmenting lists. The default list is the list that is used for the Newsletter signup of customer’s opt-in upon checkout. A customer will not be added to this list as a Subscriber unless they opt-in upon checkout. Most stores are interested in segmenting customers based on purchases. Since the transactional data is sent to MailChimp, it’s recommended that you segment your lists from MailChimp and not EDD’s Per-Product list settings. See https://mailchimp.com/help/segment-a-list-by-purchase-activity/ for details. This ensures a customer is never added to your list without opting-in. In some cases, stores may want to add customers to a list without requiring the customer opt-in. Please be aware that this can be illegal and/or against GDPR rules, so use with caution. To avoid this, segment via MailChimp (see above). If you require this ability, this can be done by using the Per-Product mailing list settings. These settings allow you to add customers to lists and/or Interest Groups based on the purchase of a product. It would be recommended that you use a separate list for Per-Product subscribers, separate from the Default list for you newsletter. Otherwise customers will get subscribed to your Newsletter whether they opt-in or not. See Per-product Mailing List Settings below for details on how this works. NOTE: Per-product lists do not support opt-in. This means the customer will be subscribed regardless, of whether they opt-in to the default list or not. Additionally, if you use the same list for your newsletter and per product list, a customer will be Subscribed regardless even when not opting in. If this goes against your country’s GDPR practices or this is not behavior you want, it’s recommended you segment lists via MailChimp and not EDD or use a separate list for your download selected lists. The per-product mailing list settings are separate from the default list setting you configured previously. The per-product mailing list settings require that the customer opt into the mailing lists during checkout by checking the signup box that you configured previously in order to add customer's to the selected list/group. Note that the groups under the lists come from the groups you create for the list in your MailChimp account. Learn more in MailChimp's documentation on list groups. Once you create groups, click Save Changes in the EDD MailChimp settings to make new group data accessible to EDD. If you install this extension when you already have customers, and you'd like to get past data into your MailChimp lists, you can use the Force Sync option. Go to Downloads → Settings → Extensions → MailChimp → Connected Lists and find the list you wish to sync. By clicking "Force Sync Now", it will sync all of your store's purchase data into your MailChimp account so that you can send targeted campaigns out to specific types of customers in your shop - right from within your MailChimp Dashboard. To learn more about MailChimp's targeting options based on sales data, see this document. Note: When doing the import, a tag will be created on the user at MailChimp indicating what product was purchased. Note: Importing sales data does not add users to your email lists. It only imports the sales data for your existing subscribers and connected them together. For example, if User A is already on your list in MailChimp and then makes a purchase on your store, MailChimp will learn that User A made a purchase. This way you can target emails to "First-time purchasers" for example. Note: If your store makes more than 1,000 sales a month, we recommend not doing more than a month at a time to avoid exceeding MailChimp's max number of API calls in a given timeframe. Note: Abandoned cart recovery is not currently supported with the EDD MailChimp extension. Why can't I see my new MailChimp lists in WordPress? The extension only retrieves lists from MailChimp every 4 hours (approximately). This is to prevent your site from contacting MailChimp too often. To force refresh your lists, go to Downloads > Settings > Extensions and click Save Changes. Why aren't users being signed-up at checkout? The most likely cause is the customer did not opt-in via checkout. If they did not opt-in, they will not be added to your list. Make sure "Show Signup on Checkout" is enabled via the EDD Mailchimp extension settings. If you have set up anything that causes the customer to bypass the "normal" checkout screen, they won't be added to the 'Checkout' MailChimp list based on your default MailChimp settings. A few examples of this would be " Buy Now" buttons via Stripe Checkout, Paypal, or any other checkout-bypassing setup. If you are using the Free Downloads extension and you want your users to be subscribed to MailChimp when downloading, make sure to check the "Display Opt-In" setting under Downloads → Settings → Extensions (tab) → MailChimp (section). If my store is set to bypass the checkout screen, will customers be subscribed to the MailChimp per-product mailing lists? No. A customer has to opt-in upon checkout or via Free Downloads to be added to your MailChimp list as a Subscriber. Why didn't a purchase get logged in MailChimp? - Any other reason the cookie might not exist will cause the purchase to not be logged in MailChimp.